18th July: I’ve been very busy with work since my last post or very lazy with keeping this up to date, and the more time has gone by the less I felt like spending time doing this but I’m getting it all together today and bringing things up to date. Gigs: Have now joined The UK Pink Floyd Experience and we are touring the UK extensively and a tour of Israel is planned for the New Year. Dire Straits UK is increasing its presence and receiving great feedback, as is Genesis Legacy which has notched up three shows now with a handful more this year. All venues have offered us return visits. A youtube recording of Brothers in Arms done jointly with Sina has notched up nearly 6.5 million hits at the time of writing this. Composing: Music library tracks devised with Darren Allison are in the mix stage, though on hold a little as he completes a CD for Clint Bradley for which I have created a string arrangement. Arranging: have just had a really productive meeting with Tot Taylor and we are beginning work on a project of his which will take some months to complete, but more information as it becomes available. My biggest task this year was to prepare a working full score for Romero The Musical in anticipation of the eponymous priest’s conversion to a Saint by the Catholic church later this year. We hope to create a recording in the studio imminently. As it is a 19 piece orchestra it has not been a quick job! Running concurrently I have been creating backing tracks for Ines Marto’s production of Portuguese Revista for a show in Lisbon later this year. I can also do transcriptions of previously recorded songs – these can be recreations of previous recordings created so a singer can perform along to them perhaps in a new key or tempo. Take a look at this page for examples. I am also working on cover versions of songs which rework the song into a completely different style and mood for new artistes. Compose: Do you need a special piece of music for a film, TV series, setting of some words you need help with? I can compose in many different styles having studied composition extensively at Cambridge – I’m happy knocking off an authentic fugue as much as a New Metal style film score! I particularly enjoy co-writing with someone who has many ideas but lacks the knowledge to turn this into a finished score or recording. If you are a lyricist or producer I can work with you too, adding sections to songs and extended musical pieces. Keyboard Player: I am available for tours, shows and gigs any style considered. Or if you need keyboards or samples in the studio I have much experience in a very broad range of styles. I am also a good sight reader and improviser so you will find a lot can be done in a short sessions time! Best of all, nowadays with digital recording, you can send me your track and I can add the keyboard parts over the top and send the files back to you for adding to your project. Teacher: One to one tuition in the following subjects – Piano (Beginner to Grade 8), Church Organ, Music Theory (All grades), Harmony and Counterpoint and GCSE/BTEC music support (composition and performance). Also available to help you brush up that solo you have been preparing for musicals, performances, exams. A spin off project called The Genesis Legacy is now in rehearsals and sounding amazing. I’m all programmed up and we ran the set last week – waiting to add our singers and we will be ready to go on the road early next year. Here is a preview of the associated website. 17th September: An exciting time as YourSoundTube are preparing to release a compilation CD of our young artists on September 22nd. We have specially recorded a version of Stairway to Heaven with Jadyn Rylee to be released on the same day. This album will feature the more rock orientated tracks we have recorded, including our most recent – Roundabout by Yes. This was a joy to record for me as it is a track from a band I have long since admired and loved. 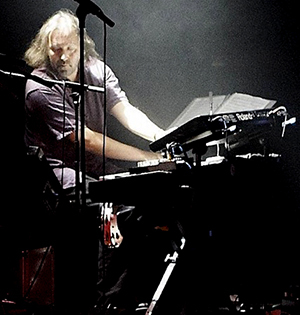 I have finished programming synth and keyboards for Genesis Legacy and rehearsals start next week. Two other projects – I have joined Spotlites Youth Theatre company as singing teacher and Musical Director on a regular basis, and am also currently working on an arrangement for a Musical Theatre piece. 1st September: Been very busy over the summer. Several YourSoundTube videos produced including Get Here and that classic song by The Kinks, Waterloo Sunset. Jadyn Rylee is going from strength to strength with my arrangements of Sound of Silence topping 5 Millions views last week and Nothing Else Matters over 2 Million. Dire Straits UK, one of my bands, collaborated with Sina Doering to recreate Sultans of Swing on the back of the success of Brothers in Arms (nearly 6000,000 views). After playing to crowds of 3000 people last month, we are forming a new tribute called The Genesis Legacy which will feature post 1980 Genesis projects including Phil Collins solo material, Mike & The Mechanics, Peter Gabriel and Steve Hackett. More news to come. I am starting a Music Library company with Darren Allison and we had a very productive two days preparing our first compositions. Just mixing to be done now. And finally I am overjoyed to be performing once again with that superlative songwriter Gerry Colvin. We have a long history and I was lucky to have been part of his band back in the 1990’s. He is gigging more than ever on the back of the revival of Terry and Gerry and his recent support spot with Status Quo. Also playing is Jerome Davis who was part of the Simon Warner band – Simon’s Cult album Waiting Rooms is celebrating 20 years since its debut. 27th June: Post 16 assessments at Plumstead Manor for Pop Music Performance – I will be verifying their BTEC results in due time! Learning up new Dire Straits songs, and also some Genesis tracks for a new project – more about this soon. Jadyn’s youtube channel goes from strength to strength with 3.5 Million hits for The Sound of Silence and over 2 Million for Nothing Else Matters. We also have a new artist being launched later today as well as a wonderful collaboration between Jadyn, Sina and a Romanian whizkid guitarist called Andrei doing a cover of Fleetwood Mac’s Go Your Own Way. 15th April 2017: Remixed my band (Dire Straits UK) demo including Lady Writer, Your Latest Trick, Walk of Life and Brothers in Arms. Now with new Lead Vocal, Guitar parts and BVs. Sampler can be heard here. 23rd February 2017: Produced a version of George Michael’s Different Corner for Jadyn Rylee as part of the Youtube project – youtube link here. The amazing Avonlea has recorded a version of Something by the Beatles with the whole YourSoundTube team. 7th December 2016: Just finished recording a YourSoundTube version of Rush’s ‘Tears’ – my colleague Mike is finishing off the mix. 8th November 2016: Status Quo’s Aquostic 2: That’s a Fact released straight into number 7 in the UK album charts. Listen to one of the tracks here. Just finished a couple of YourSoundTube arrangements for some exciting new artistes. Recording in process. 1st October 2016: Just finished recording Status Quo’s Aquostic II – That’s a Fact and rearranging strings for their appearance in Hyde Park this month. Currently working on YourSoundTube – a brand new project with my old friend Mike Doering. 27th September 2016: Mixing three demo tracks for AbbaFreed project. Thanks to Nicole Faraday for vocals and Mike Doering for extra guitar on SOS. Quick sample here. 20th September 2016: Status Quo’s Aquostic II in final production now and due out in October – you can read a pre-review of it here. Just finished arranging and rehearsing strings for the live BBC2 Hyde Park show and now concentrating on my new venture with my old friend Mike Doering called YourSoundTube. Take a look at the promo video here.